The International Graduate Program for non-Japanese students was launched in 1999, offering advanced professional training leading to the degrees of Master of Engineering and Doctor of Engineering. Students will have the unique opportunity of taking a degree from the University of Tokyo with lectures and research conducted completely in English. Applicants who have exceptional academic records will be awarded scholarship. 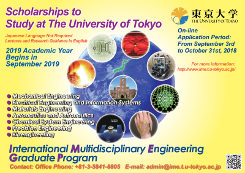 The program is formed by the following 7 departments out of 19 departments in the School of Engineering, the University of Tokyo. Applications of self-supporting students for 2016 will start from January 5th. On-line application for 2016 academic year will start from September 1st, 2015. We will update Prospectus for 2016 soon. Application for 2015 academic year was closed. This website has been updated for self-suppoting applicants for 2015 academic year. This website has been redesigned. Copyright © 2014 IME Graduate Program. All Rights Reserved.